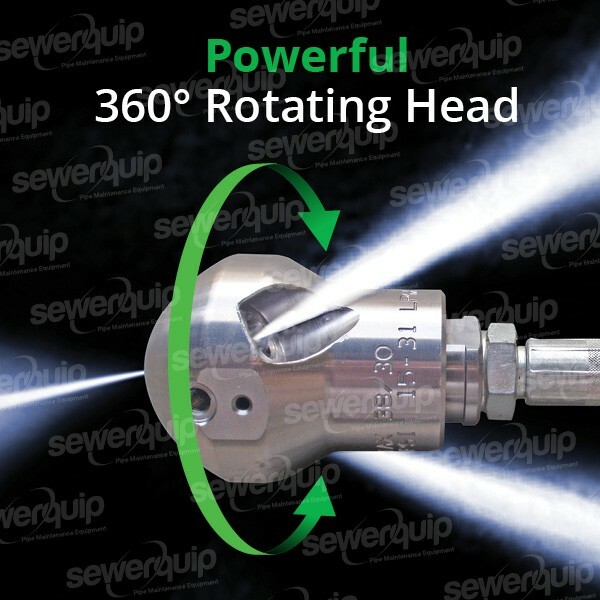 The Rootax nozzle is a "controlled rotation" root cutting nozzle that is up to 70% more powerful than conventional root cutting nozzles. Controlled rotation allows the water jets to stay solid and have more impact on tree roots or obstructing objects. With a front jet offset at 15°, the Rootax cutter is its own penetrator, quickly cutting its way into solid root masses, allowing the large rear jets to cut and flush the tree roots from the pipe wall. Can be jetted to suit flows from 21Lpm – 35Lpm. Replaceable stainless steel jet inserts. Made in Australia from hardened stainless steel.